After over three years of operating with a ‘heresy trial’ overhead, the West Hill United Church is celebrating their freedom to practice religion the way they want to. The controversy began in January 2015, after Vosper responded to the United Church of Canada’s past moderator Gary Paterson’s prayer for the victims of the Charlie Hebdo shooting. In her published response, Vosper explained that upholding morality as determined by God only allows others to make the same claim, including those who would enact the will of a holy being through violence. 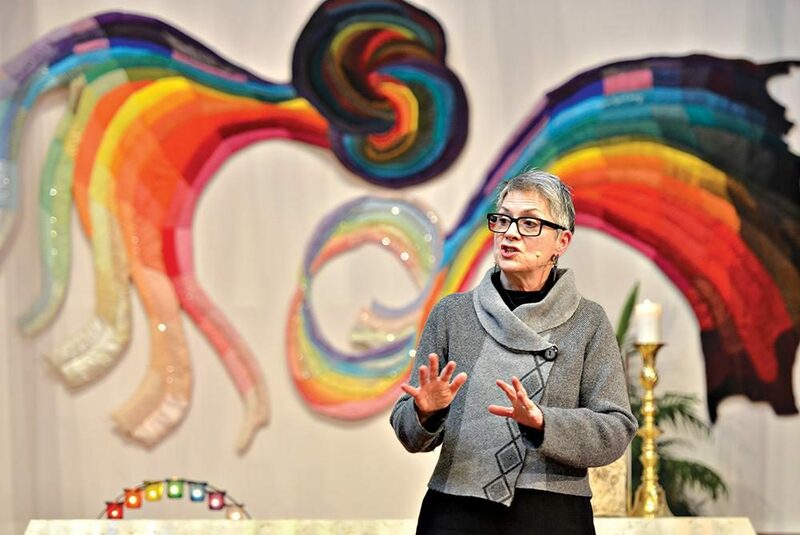 Following her response, the Toronto Conference of the United Church of Canada decided that action was needed to review Vosper’s methods of ministry and if they were in line with the church’s doctrine. After a long legal battle, the Toronto Conference reached a settlement with Vosper. It was decided in November 2018 that she would remain in ordained ministry; a decision that Vosper, her congregation and a number of her peers celebrated. Being able to go forward into the new year without a looming trial has brought them relief. At the West Hill United Church, a typical Sunday gathering begins with a greeting period. The pianist fires up a lively tune and the church breaks out into a bustle as every member of the congregation goes around to shake hands with one another, welcoming them into their space. A rainbow of streamers hang over their heads. There is no crucifix looking out on the crowd from behind the pulpit. Instead, a tapestry of rainbow coloured cloth is wound into knots, signifying the ways that they hold each other together. It represents a journey from pain to healing, not unlike the one they are currently on. For some within the United Church, their distaste toward Vosper is fueled by her use of the identifier ‘atheist’. She says that this is bigotry at work. But upon a glance at her work, these characteristics are not indicative of Vosper. While the pews are mostly gone and the traditional symbols of the church have been removed, they have been replaced with new artifacts of meaning for the people in their midst. After the greeting period, community sharing time approaches. During this time, members of the church share well wishes for those at-risk in Canada and abroad. Someone calls out for those affected by drug use in Vancouver, another for the many people facing conflicts in Africa, while others speak of people they know personally. One parishioner, a woman named Mel Crossley, spoke of a family who had been asked to leave another church after going through a personal tragedy, and told them that they would be welcome among a church like theirs. Despite the judgment they have faced within and outside of their denomination, the churchgoers of West Hill United Church stay positive and welcoming. And despite being a “great white wall of seniors,” as Vesper describes, their community breaks the negative stereotypes that can be associated with them by continuously working to be attuned to the need for social justice and compassion for people from all walks of life. This is shown in the way they smile and chuckle happily at videos they’ve received of two brothers, aged 5 and 9, biking and playing sports. The boys are members of a refugee family who they are working to sponsor into the country. The Church takes pride in the work they do and the charitable donations they give in order to make the resettlement process as smooth as possible. One of the ways they do this is by buying gift cards to popular chain stores in order to supply them with the items they need upon arrival. This is just one of the many ways they work to welcome their soon-to-be neighbours into the city. In Vosper’s opinion, there is no better home for their community than Scarborough. West Hill United Church may not conform to the traditional ideals of religion, but they do embody what lies at the heart of every faith; fellowship, morality and devotion.